Powerlifting includes three basic lifts: the squat, the bench press, and the dead lift. Athletes are first classified by weight and then divided by ability. Men and women can participate in all powerlifting events. Single event competitions are the bench press, squat and dead lift. Athletes who train and compete in more than one event have the option of competing in a combination event. This combines lift totals from the bench press and dead lift for a combination total score or totals from the three lifts for a triple combination total score. This is an annual event hosted by Special Olympics Georgia during the month of January. More information to come at a later date. Hosted by Special Olympics Georgia, this event is typically held in January. Local programs are responsible for all travel and housing costs for this event. About Powerlifting: Every athlete aims at lifting more weights than the opponent using specific moves. In Special Olympics Powerlifting includes the deadlift, squat or bench press. Training, determination, and attitude are the key facts that define the balance between a successful or a failed attempt. Differences of Special Olympics Powerlifting: Special Olympics, Inc. Allows for athletes with physical disabilities to wear a two-piece outfit with both upper and lower pieces being form fitting. A full-length aerobic suit may be worn while performing the bench press. Additionally, lifting with a prosthesis is allowed and orthosis with shoes will be allowed. 1991 was the first–year powerlifting specific events were offered at Special Olympics North Carolina Summer Games. Prior to this only eight training and fitness exercises were offered. In 1992, four local programs were the first to participate in a North Carolina High School powerlifting meet in North Wilkesboro. 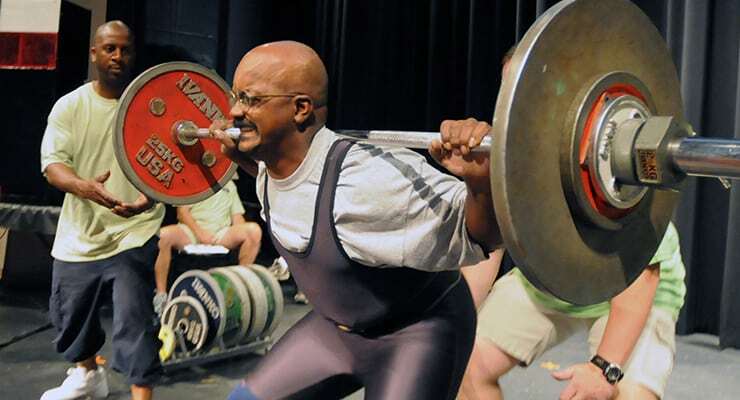 The squat event was introduced to Special Olympics North Carolina during the 1992-1993 program year.